Classic Poker Chips LLC is a Delaware based corporation with offices in Florida & London and a factory in Maine. The owners are David Spragg, current Secretary of, and David Sarles, past President of, the Casino Chip & Gaming Token Collectors Club. We continue to offer the same high quality hand crafted real clay poker chips that have been made in Maine for over 100 years. 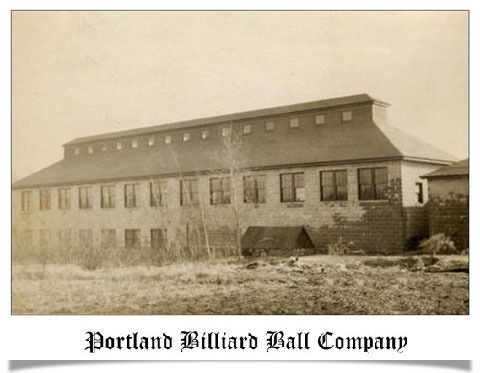 In 1912 Alonzo Burt founded The Portland Billiard Ball Company in Portland Maine, specializing in high quality billiard balls manufactured under a patented process. The company also made numerous other products including checkers, dominos, tally balls, and bowling balls. By the early 1930's the Portland Billiard Ball Company had begun manufacturing poker chips along with billiard balls. At first these were very simple designs made from a clay like composition material or an early plastic called Plaskon. Plaskon was marketed under the trade name "Breaknot". By 1935 the Portland Billiard Ball Company had changed it's name to the Burt Company and developed a completely new style of chip called the metal die cut. Die cutting metal foil with unique designs and applying them to chips became the company's signature product before the second world war. From 1941 to 1945 chip production was limited. Most of the company's work was in government contracts, the manufacture of ammo cans being primary. In 1947 the Burt Company purchased United States Playing Card's chip manufacturing equipment. This purchase eliminated USPC as a competitor and established the Burt Company as America's leading chip maker. The late 1940's saw a shift to a higher quality printed center chip and the first use of colored edge spots. In 1954 the Burt Company introduced the first multi-colored edge spots and the first house mold at the Golden Nugget. A house mold casts the name or logo of a casino into the rim of the chip. Also in 1954, the Flamingo Casino proudly displayed a picture of the new "Champagne Tower" addition in the center of their roulette chips. Casino owners Wilbur Clark and Benny Binion put their pictures on their casino's chips. The Burt Company continued making poker chips well into the late 80's. In 1988, Jim Blanchard acquired all the assets from the Burt Company, renamed the company Atlantic Standard Molding and continued making poker chips in Portland, Maine for 24 years until August 2012 when he decided to retire. In December 2013, two chip enthusiasts, David Spragg & David Sarles, purchased the assets and persuaded Jim to come out of retirement and set up a new factory, close to the original location. This new company, Classic Poker Chips, launched in March 2014. Today, you can buy our real clay chips made in Maine whether you are a casino or an individual. We specialize in custom poker chips made to order. A more detailed pictorial history of the old Burt Company will shortly be available here.